About The Power of Inner Guidance: Seven Steps to Tune In and Turn On! SEVEN STEPS TO TUNE IN AND TURN ON! 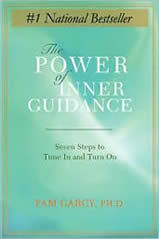 The Power of Inner Guidance: Seven Steps to Tune In and Turn On! is a book about ethical self-direction. It is for anyone who feels off-course in their lives or who is suffering because, at some level, they feel that they are not being true to themselves. It's a book that helps people to get in touch with and listen to their inner guidance system to lead happier, healthier, and more productive lives. How does The Power of Inner Guidance: Seven Steps to Tune In and Turn On! differ from other books like it? I applied researched principles of Psychology to the practice of turning inward. Unlike other books in this area, my book does not assume a specific source for the love that guides you and allows you to define this for yourself. In addition, I have very specific tips and questions that you can apply to your self-discovery in order to help determine whether or not your thoughts are healthy to act upon. Finally, I've added specific chapters on wide-spread problems that can be helped by the principles taught in this book. In my work as a psychologist, I noticed that over and over, the people who were coming to my practice were out of touch with themselves and what they really wanted to do during their lives. Detached from their desires, dreams, and purposes, I visited with people who were stressed, in conflict with themselves and others, and off-track--and they were straying further away from correcting their course! I noticed that people all around me were also suffering needlessly, simply due to not knowing how to reconnect with themselves and correct themselves. Some suffered from depression, suicidal thoughts, anxiety, panic attacks, dysfunctional relationships, and others from compulsive behaviors, eating disorders, substance abuse, chronic pain, and chronic stress. I reasoned that if I could help people to stop and turn inward for answers, and learn to decipher and apply the healthiest of these answers, much of this suffering would cease. I noticed that the healthiest inner messages were often based in love toward the self and others, leading me to develop the phrase "the love that guides you." In addition, I learned that my patients required practical tools for overcoming the insane thoughts that often overpowered their thinking and the creation of new habits. The Power of Inner Guidance: Seven Steps to Tune In and Turn On! offers you the same lessons that I have learned in my own life and that I have been guiding my patients to learn.